Tue, September 19, 2017 7:00 P.M.
On Tuesday, September 19 join the Free Library of Philadelphia in the Skyline Room & Terrace for the official book launch of Patrice Banks. 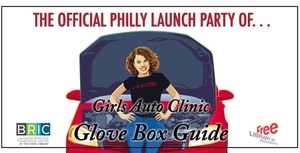 The Girls Auto Clinic Glove Box Guide is the one-stop-do-it-herself-guide to auto maintenance! Be among the first to receive a copy of Glove Box Guide and hear Patrice share her remarkable and empowering story. The Glove Box Guide empowers women to take control of the wheel so they never feel mistreated, misunderstood, or taken advantage of again. It provides readers with answers to all their common car questions through DIY instructions, tips, and illustrations. Get your tickets today on Eventbrite!